The defending Stanley Cup Champion Washington Capitals will begin their quest for a repeat when they host the Boston Bruins in the 2018-19 season opener at Capital One Arena on Wednesday night. The game will be televised on NBC Sports Network at 7:30 PM. The Bruins were one of the biggest surprises of last season, recording 50 wins and 112 points. They only finished one point behind the Tampa Bay Lightning, who they fell to in five games in the second round, for first in the Atlantic Division. Boston finished last season with the third-lowest goals against with 214. Only the Los Angeles Kings (203) and the Nashville Predators (211) gave up fewer goals than the Bruins. The Bruins also finished sixth in the league with 270 goals for. The Bruins announced this week that the team has lost one of their top defensemen in Torey Krug, who led Bruins’ defenseman with 14 points and 59 points a season ago, for three weeks after suffering an ankle injury sustained in the Bruins’ preseason finale on Sunday against the Philadelphia Flyers. Center Patrice Bergeron will likely play on Wednesday after offseason groin surgery and dealing with neck spasms. Bergeron and Bruins’ head coach Bruce Cassidy stated that there are no issues regarding his injury. Boston boasts arguably the best top line in the NHL with Bergeron, who had 30 goals and 63 points in only 64 games last season, forward David Pastrnak, who tallied 35 goals and 80 points in 2017-18, and forward Brad Marchand, who led the team with 85 points and recorded 34 goals despite missing 14 games last season. The Bruins got a lot of key contributions from their rookies last year. Forward Danton Heinen recorded 16 goals and 47 points last season, forward Jake Debrusk tallied 16 goals and 43 points last year, and defenseman Charlie McAvoy recorded seven goals and 32 points despite missing 18 games. The team also signed forward Ryan Donato out of Harvard University, where he racked up 26 goals and 43 points in only 29 games for his second consecutive season of 40+ points in the NCAA. He also scored five goals and six points in five games at the Winter Olympic Games, where he represented Team USA. Donato, 22, was phenomenal when he got to the NHL and tallied five goals and nine points in 12 games at the end of last season, including a two-goal three-point performance in his debut. The whole team, including the rookies were fantastic up until the second round of the 2018 Stanley Cup Playoffs. After beating the Toronto Maple Leafs in seven games in Round 1, the Bruins lost four straight to the Lightning after winning Game 1 of the series. Tuukka Rask, who went 34-14-5 with a .917 save percentage and a 2.36 goals against average in 2017-18, will likely get the nod between the pipes for Boston. He is coming off of a disappointing playoff performance, posting a 5-7 record, a .903 save percentage, and 2.88 save percentage in 12 playoff games last spring. Rask is 1-10-5 with a save percentage of .889 and a goals-against average of 3.07 in his career against Washington. 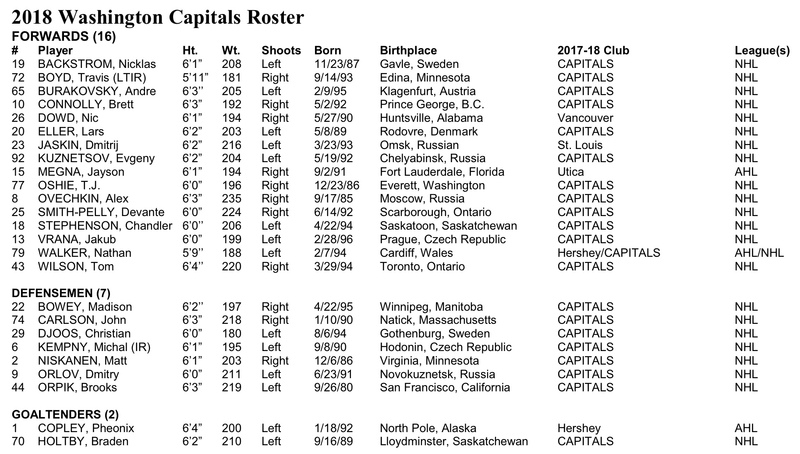 The Capitals are set to raise their first Stanley Cup Banner before the game on Wednesday and return most of their lineup who won the championship last Spring. Only center Jay Beagle and goaltender Philipp Grubauer are gone from the team that dressed for Game 5 of the Stanley Cup Final on June 7. Washington led the Metropolitan Division for the third consecutive season with 105 points last season. Captain Alex Ovechkin led the NHL with 49 goals and the team with 87 points a season ago, the seventh time in his career that he had done so. The 32-year old is coming fresh off a Conn Smythe Trophy as playoff MVP. Ovechkin led the NHL with 15 goals in the playoffs and was second with 27 points. Only linemate Evgeny Kuznetsov (32) had more postseason points than Ovechkin. The Capitals were second in the playoffs with a power play efficiency of 29.3%. However, the Bruins were first (36.4% efficiency). The team seeks to avoid the dreaded Stanley Cup hangover, which has been a pattern for teams coming off of a Stanley Cup. Those teams usually start the season slowly but heat up around January. The team insists that the Stanley Cup victory is behind them but we will just have to wait and see… especially after all of that partying they did over the summer. Head coach Todd Reirden will make his NHL head coaching debut. The 47-year old coach, who is known for his strong ability to communicate, has been on the Capitals’ coaching staff the past four seasons, including the past two as an associate. He took over June 29 after head coach Barry Trotz resigned on June 18 and signed a five-year contract with the New York Islanders a few days later. Reirden has been in charge of the defense and the power play during his time in Washington. He handled the defense and the penalty kill when he was an associate coach for the Pittsburgh Penguins from 2010-14. Forward Tom Wilson, who has an in-person hearing with the NHL’s Department of Player Safety Wednesday morning, will likely miss the first few games of the season due to suspension. He was thrown out of the Capitals’ 5-2 win in their preseason finale against the St. Louis Blues after delivering a high hit to forward Oskar Sundqvist, who left the game and will miss an extended period of time. Wilson recorded a career-high 14 goals, 35 points, and a +10 rating in 78 regular season games last season and five goals, 15 points, and a +11 rating in 21 playoff games. He skated alongside Ovechkin and Kuznetsov in the playoffs. With Wilson out of the lineup, forward Dmitrij Jaskin could make his Capitals’ debut. Jaskin, 25, was claimed off of waivers by the Capitals from the Blues on Tuesday. Jaskin tallied six goals and 17 points in 76 games last year. In 266 career NHL games, all with St. Louis, Jaskin has recorded 25 goals and 61 points. The Capitals will open the season against a team they have really enjoyed seeing over the past few years. Washington has gone 12-0-0 over the past four seasons against Boston. Though, the Bruins won both preseason meetings between the two teams. Braden Holtby will start for the Capitals on Wednesday. Holtby, 29, is coming off of his worst season in his career, where he posted a 34-16-4 record with a career-high 2.99 goals-against average and a career-low .907 save percentage. However, he was excellent in the playoffs after sitting the first two games of Round 1 against the Columbus Blue Jackets, posting a 16-7 record, .922 save percentage, and 2.16 goals-against average. Holtby has excelled against Boston, going 14-2-0 with a .940 save percentage, the second-highest against one NHL team, and a 1.96 goals-against average, his third-lowest against a single team. Both teams will begin the season with back-to-backs. The Bruins visit the Buffalo Sabres on Thursday night while the Capitals battle the Penguins at PPG Paints Arena that night. Without Backstrom due to suspension and down 2-1 in the 2012 Eastern Conference Quarterfinal Series to the Bruins, forward Marcus Johansson gave the Capitals a 1-0 lead 82 seconds into the game. The Bruins would tie the game on a goal by forward Rich Peverly later in the first period. It would remain a tie game until forward Alexander Semin struck with 1:17 left in the second period on the power play. Holtby made 44 saves to even the series and send the Capitals up to Boston with a tied series. The Capitals would win the series in seven games. 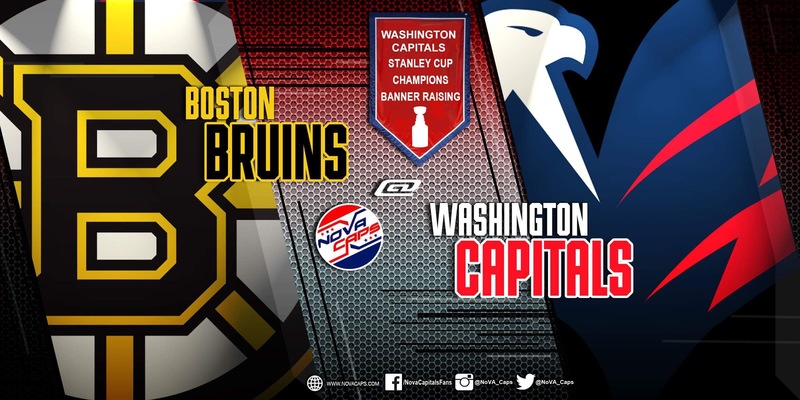 This entry was posted in Games, News, Washington Capitals and tagged 2018-2019 Washington Capitals, Boston Bruins, Capital One Arena, Capitals Championship Banner, Game Preview, Harrison Brown, Washington Capitals. Bookmark the permalink.